Canada isn’t famous just for robot space arms and sparkly ginger ale, they also were once noted for building Mercury-badged pickups. One of those -today’s Nice Price or Crack Pipe M100 - may look like a Ford, but will its price have you saying oh Canada? Someone looking to pick up a natty U.S. edition Ur-Quattro could do far worse than to drop the asking on yesterday’s 1983 flare-fendered Audi. At least that was the opinion of the 65% of you who begrudgingly gave the car a Nice Price win. It seems like while you felt it was a fair price, you also maintained that the four ring’d four-by-four really shouldn't be worth that much, even if it is. Ford opened their Windsor Canada plant in 1904, only a year after the company was founded on the other side of the Detroit River. Various opinions exist as to why Ford built and sold pickup trucks in Canada under the Mercury name. Some claim it was because not all Canadian communities had both a Ford and Mercury dealer from which to choose, but onerous sales and excise taxes in Canada more likely played a part. Whatever the reason, the company introduced the Canada-only Mercury pickups in 1946, and produced the F-series doppelgängers until they were phased out in early 1968 after the 1965 Automotive Trade Agreement between the U.S. and Canada was signed. 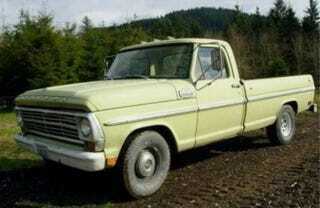 Today’s 1968 Mercury M100 is virtually identical to a U.S. Ford F100, with minor exception. The grille, body, mechanicals and even the VIN and warranty plates are the same, and from 20 yards, you probably wouldn't even notice the MERCURY name proudly fronting the hood and stamped into the tail gate. For rabid fans of Ford trucks, these alone are worth their weight in gold. The post ’65 M trucks also had unique Mercury badging on the steering wheel horn button as well as the hubcaps. This electric yellow styleside seems to have the stock tiller, but at least one wheel has been replaced with one of those white spoke jobs. There’s no picture of the passenger side so it’s impossible to tell if the dog dishes remain over there. The truck’s condition seems rough but passable, possessing an authentic patina rather than that of a poseur. Inside the wide bench has been covered with one of those TV static patterned covers. The rest of the cabin accoutrements are appreciably proletarian, but it does possess three pedals and a very long stick. What that 3-speed stick sits behind is a mystery as the ad doesn’t say. Whether it’s a six or an eight, it’s the same as any 1968 Ford F100, the days of north of the border Mercurys getting higher output mills long gone by then. 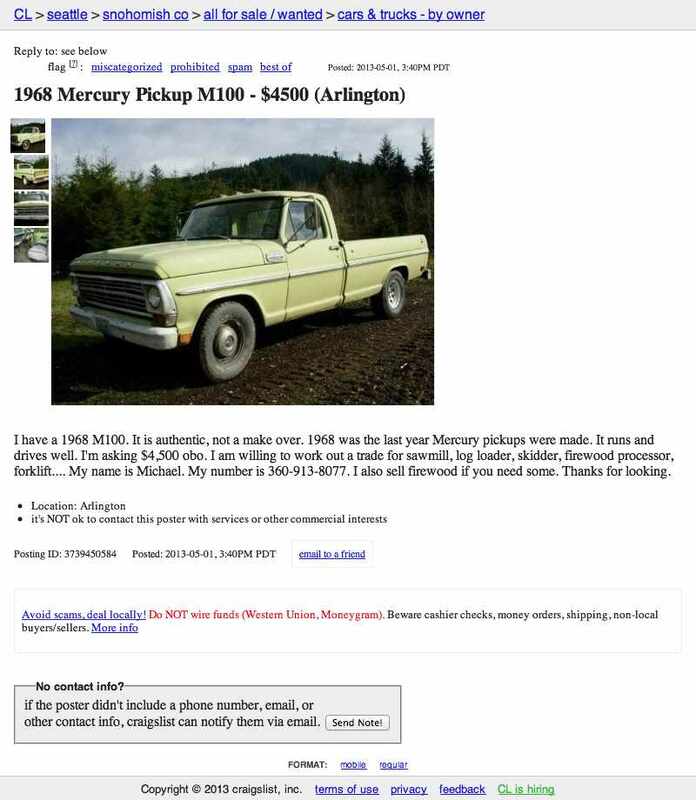 It’s now time for you to decide if this Mercury truck should be long gone for its $4,500 price. What do you think, is that a deal for this rare but thinly veneered F-series clone? Or, does that price make you not want to join this Canadian club?